When tragedy strikes anywhere in the world, the State of Israel is always among the first to offer help, sending experienced rescue teams, portable hospitals and world-class medical experts to the scene. Israel is a world leader in medical research, farming technology, and military innovation. The country that made the desert bloom is the undisputed champion of hi-tech innovation, all of which it generously shares with the world. Unfortunately, when it comes to morality, the State of Israel has the distinction of holding a number of world records which no other country would want. Israel is the only country in the world ever to voluntarily expel its own citizens from chunks of its homeland in order to hand over the land to its enemies. It is the only country in the world ever to voluntarily destroy the homes and businesses of its own citizens, leaving them with shattered lives and broken promises. Israel is the only country in the world ever to voluntarily dig up and transport the graves of its dead so that the land could be turned over to its enemies. Israel is the only country in the world to restrain its military from rescuing a wounded soldier, for fear of provoking the enemy and risking its approval ratings with the world. The soldier, injured by enemy gunfire at a Jewish holy site, slowly bled to death needlessly while the IDF stood by and watched. Israel also remains the only country in the world ever to voluntarily cooperate in the prosecution of its own intelligence agent, refusing him sanctuary, turning over the documents to incriminate him, denying that the state knew him, and then allowing him to rot in a foreign prison for decades on end, cravenly forgoing its right to simple justice for the nation and for the agent. Additionally, Israel is still the only country in the world ever to violate its own system of justice by repeatedly releasing dangerous, unrepentant murderers and terrorists back into the civilian population with impunity. No other country in the world has ever done this! In summary, Israel has the dubious distinction of being the only country in the world so befuddled by moral ambiguity that it is willing to dishonor its dead, betray its bereaved, and disgrace its citizens for the sake of political expediency. EARLIER THIS WEEK, the State of Israel began the staged release of some of the worst murderers and terrorists the world has ever seen. Twenty-six out of the 104 murderers scheduled for release went free on Tuesday. Many are serving multiple life sentences for their heinous crimes and their many victims. The blood of their victims cries out from the grave at this affront to human decency. Their cries go unheard. The bereaved families of the victims beg and plead not to free the savage murderers of their loved ones. Their entreaties are ignored. 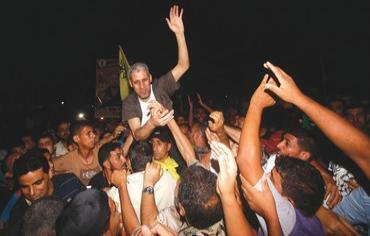 All the polls indicate that the overwhelming majority of Israeli citizens are opposed to the release of the murderers. It is a strange kind of democracy that pays no heed whatsoever to the will of the people. No Israeli official has advanced a single compelling reason in support of the wholesale release of these murderers and terrorists. The claim that it "serves national interests" is spurious. There is no national interest that supersedes morality. The second-most touted excuse is that the government of Israel was given three existentially threatening choices by its best ally, and the least damaging choice of the three was the release of murderers and terrorists. Did anyone at the helm ever consider that given three life-threatening choices, the only response is: "No, no and no!"? Overriding all objections, the government of the State of Israel is bound and determined to release the murderers, whose victims are not all dead. Some have been maimed, crippled and disfigured for life. Others show no external scars but have had parents, children and loved ones amputated from their lives. No one sees the broken hearts that will never stop bleeding for their loss. Authentic Jewish tradition teaches in great detail how to relate to the dead with honor and reverence. The dead are not only keepers of the past; they are our teachers, our moral guides and our inspiration for the future. A country with no respect for the dead has no respect for the living. A sovereign state which is capable of dishonoring its dead by freeing their murderers and tormenting their bereaved loved ones has, in essence, discarded all of the moral underpinnings of its own existence. Nor should it come as any surprise  as any student of history knows  that no country can survive without a clearly defined moral infrastructure. The Land of Israel is eternal and the State of Israel has temporal stewardship over the land. The corrosive moral ambiguity that has brought us to this dreadful day is relentlessly eating away at the legitimacy of the state's continued role as legal guardian of the land. The prognosis is dire. Only a reawakening of national resolve and a rebirth of ethical politics rooted in national self-respect, moral rectitude and courage of conviction can guarantee the future. No political process devoid of these fundamental values will ever end the agony or the fear for the State of Israel. It is clearly time for an historic restoration. Jonathan Pollard perfectly articulates what I have been thinking and saying — and then some. Thank you so much, Jonathan, for your moral clarity and for your great sacrifice on behalf of the Jewish people. 28 years in high security for what money? speaking resultatively he saved israel from a nuclear iraq and was betrayed for all his efforts. i read his (clearly zionistic) pre prison life history. I just don't understand the lack of even the most basic sense of gratitude or common sense... spitting in pollards face like you did makes my "vitriol" taste like sweetener. Thank you Jonathan for speaking the truth and still believing in the country that betrayed you. Don't forget that almost all of the Israeli public and the Jewish people is unified behind you. To all of those who say Pollard is a traitor and should rot in prison - you are missing the point that his case has nothing to do with Israel or the Jews. It has to do with a US citizen convicted of passing classified information to an ally - this is a crime for which no one has ever received a life sentence besides Jonathan Pollard. The median sentence is 2-5 years. For this reason and this reason alone Jonathan Pollard should be immediately released from prison. am 100 percent in favor of all of Jonathan Pollards wise statements, he Is a Very intelligent individual, without blood on his hands, and you cannot say that about the 26 MURDERS and thoses who released the Cold Blooded MURDERS should go directly to prision the very moment one of these Murdering Killers-KILL again and we all know one of these will soon kill again, and our president will also be accountable and this I pray. I am appalled at the wimp Netanyahu has become. He should have told Israel's 'friend' Obama, 'We will consider further talks with our enemies when you bring pressure to bear on Turkey leaving Cyprus, which it invaded in 1974. After all, Turkey is occupying territory it invaded, whereas Israel occupies territory gained from an enemy bent on destroying the State.' That would have stalled the Kerry mission. The most painful point for the USA is that Pollard supplied Israel with the information that the USA was obliged to according to then existing agreements on cooperation, but didn't. Nobody likes to be pushed into his own crapp. Jonathan Pollard is completing his 28th year of an unprecedented life sentence in an American prison for espionage on behalf of Israel John Loftus was Trial Attorney Office of Special Investigations, Criminal Division Headquarters, US Department of Justice, Washington DC. and has seen the entire classified file. He wrote to President Obama, "No comparable prisoner in American history has received a sentence of this magnitude. Quite frankly, Pollard was a handy receptacle for shifting blame from the intelligence community. As I discovered, Pollard could not possible have leaked our Soviet Humint assets as he lacked the necessary blue stripe security clearance to even gain access to their identities. Finally, the first damage assessment on Pollard showed that our national security suffered minimal, if any, damage from Pollard's disclosure to Israel. The second damage assessment, prepared with the assistance of Soviet spy Aldridge Ames, intentionally sought to shift blame towards Pollard and away from Ames. The 'blame Pollard' mantra did substantial damage to our national security as it allowed Ames and his co-spy at the at the FBI to continue funneling our secrets to the Soviets for several more years. [emphasis added]" Read more about his unjustified prolonged incarceration in an article by Bryna Berch, "US Wrongly Punishing Pollard For Crimes He Did Not Commit" here., in an article by David Zwiebel, "Why Jonathan Pollard Got Life," here and in an article by Jock L. Falkson, "The Travesty of Pollard's 10,000 Days and Counting" here.